Ranchi: It’s not just Motilal Baske’s family, villagers and political parties demanding justice in the controversial encounter. Now, CPI-Maoist has also demanded judicial inquiry into the killing of Baske. The banned outfit issued a press communiqué, which states that Baske was killed in a fake encounter. 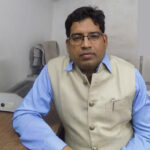 It further said, that the tribal man, gunned down by Jharkhand Police was not even a simple member associated with the group, leave aside the theory of him being member of People’s Liberation Guerrilla Army (PLGA). PLGA is the armed unit of CPI-Maoist, which engages in activities of attacking on police and government. The outfit has also demanded action to be taken against the accused officers. The moment is getting stronger. The voices are getting louder. Jharkhand Mukhti Morcha’s (JMM) Giridih unit led by Sudiv Kumar Sonu, reached Ranchi today along with Parvati Murmu, widow of Baske to meet former chief minister Hemant Soren. In the press met Soren has demanded a compensation of Rs 25 lakhs, a government job for Baske’s kin and appropriate punishment for those accused. Kumar, who is also a practicing lawyer at the Supreme Court, also claimed that they may move to the Apex Court if required. While CPI-ML observed protest day across district and demanded Rs 50 lakh compensation for the deceased family. 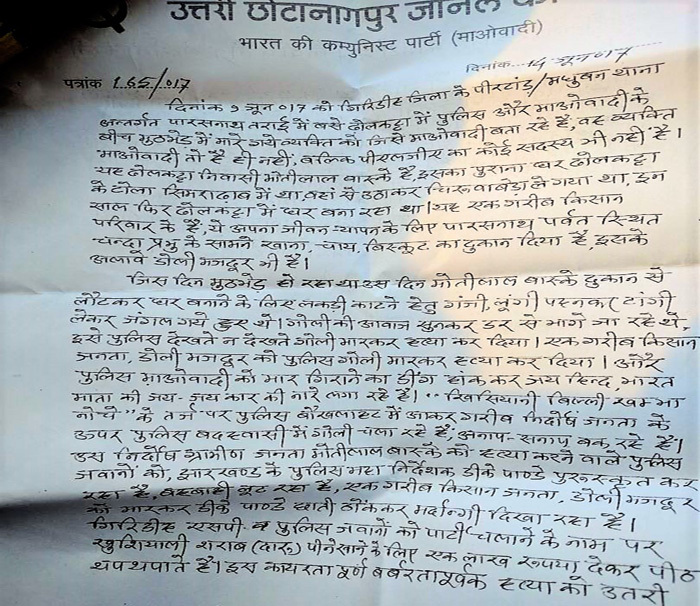 The communiqué released by North Chotanagpur Zonal Committee of CPI-Maoist, validated that the Jharkhand police did attack them, but none from their group had been killed. It also narrates in detail, how Baske, a poor labour, who was accidentally present on the spot, got killed. The communiqué even expressed surprise at Jharkhand Police’s Director General, rewarding the police for a fake encounter. The two pages communiqué narrates, “When the encounter took place, Baske wearing a lungi and a banyan, was chopping woods with his axe. On realizing that firing was taking place in the vicinity, he fled, but was gunned down by the police.” It further adds, “After killing Baske, the officers were heard chanting – Jai Hind, Bharat Mata Ki Jai, which sounded like khisiyani billi khamba nochey (police shouting out of frustration). DGP DK Pandey rewarding the police for killing an innocent poor man, sound so sad,” the letter said. “It is act of cowardice. It is a brutal murder,” further read the leaflet issued by the banned outfit.